Industry leader Grenda Corporation is meeting with Vic Roads this week to push for an increase in road tonnage limits for bus transport. Grenda Corporation Managing Director Scott Grenda is meeting with VicRoads CEO Gary Liddle, urging a rise of the current 16 tonne limit to 18 tonnes, paving the way for high capacity ‘trolley bus’ style vehicles in Victoria. "We are trying to legislate for what currently exists in the real world," Grenda says. Grenda Corporation has conducted private research that shows many fully-loaded buses when on the road are already over the 16 tonne limit. Grenda says the rise to 18 tonnes will allow trolley-style vehicles to operate in Victoria, eventually rolling out to other states such as Western Australia. "We believe if we can get Victoria over the line the other states might see the logic and follow," he says. He says a ‘light tram’ bus would be ideal for high capacity routes, currently discussed in Western Australia where a light rail is being proposed from Perth’s CBD to Ellenbrook in the north-east. "We believe the light tram is the right vehicle for that area," Grenda says. "You could run a 25 metre vehicle up there as a hybrid trolley bus. "It’s the right answer for them and it’s going to be delivered quicker and a lot cheaper than any light rail with the same carrying capacity and better environmental outcomes." 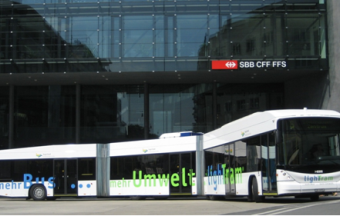 Grenda says light tram trolley buses are standard in many European countries, where he recently experienced a double-articulated version in Luxembourg. "I rode that one through Luxembourg and it was astonishing – it went everywhere," he says. He says legislation exemptions would be required in Australia to provide for the double articulated ‘super bus’. "That can happen at the stroke of a Government Minister’s pen, and any state transport minister can provide the exemption," Grenda says. He says BusVic has met with VicRoads on a quarterly basis with the push to change the 16 to 18 tonne rule going from not being on the table to being a hot issue. "By meeting the CEO of VicRoads as an industry we are saying this is the future, and part of their own planning process will be to cater for future road design – it’s an issue they are trying to help us fix," Grenda says. He adds that future spikes in oil prices could result in carrying 15 to 20 percent more people each year. "Existing services won’t cope, and it’s something we need to be aware of as a transport community." Grenda says an interim measure would be to provide 25 metre vehicles as an option to meet any increase in demand for public transport. "To manufacture or deliver something like a light tram super bus would be over a 12 to 18 month period."